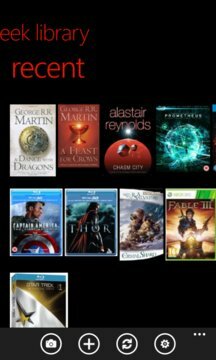 Geek Library helps you to keep track of your entire library of books, movies, music and video games on your phone and optionally backed up to the cloud. Scan an item or search a huge online database and pull back cover art and details. 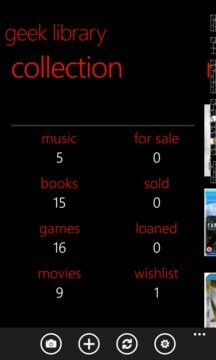 Add the item to your library or add it to a wishlist and keep track of the best deals available. Rate your stuff, update the details and add your own cover art if you want. TRY THE PAID VERSION to remove the ads and get access to the fully functional windows desktop companion app!